Smartline Investment Training Institute, the division of Smartline Global which provides investment management training to traders at banks in Europe and the Middle East, expanded its operations Hong Kong in June. 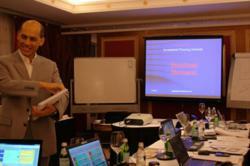 The company conducted its first seminars in Hong Kong to assess how it can best set up its business there. The seminars also helped Smartline Global integrate with Thomson Reuters to create a strategic relationship in the area since all future seminar will be delivered in Thomson Reuter’s Hong Kong offices. Those attending the first seminar were from banks, including professional traders, fund managers and brokers from the local brokerage unit. “To start operations in Hong Kong is a strategic decision we made in order to enter the Asian markets,” said Kyprianos Kyprianou the CEO of the Smartline Global. The move into Hong Kong is part of their long-term business plan for diversifying in the region, especially considering that European banks have been in a “cost-cutting” mode since September 2008. The expansion will help the Smartline Global to continue expanding until the situation in Europe has stabilized. In Hong Kong, Smartline Global will focus on clients from multinational banks, focusing on the departments of treasury, private banking, asset management and local and international investment units, essentially anyone who deals with investments. A two-part seminar has also scheduled for this fall, a professional course that will take place on October 10th-13th and November 14th-18th. Future seminars will be delivered by Kyprianos Kyprianou. The plan is to have Kyprianos Kyprianou and two company instructors deliver three seminars, one introductory and two professional, on a monthly basis in 2012 at the Thomson Reuters premises. As part of the expansion of Smartline Global into Hong Kong, the company’s trading and consulting departments have moved into Dubai, which is a business hub in the Middle East. From Dubai, one can easily travel to other parts of the Middle East, Hong Kong, Central Europe and Russia. Hong Kong itself is the financial center of Southeast Asia, with one of the highest concentrations of banking institutions in the world. In fact, 71 of the world’s 100 largest banks operate there. Its 211 authorized institutions comprise 133 licensed banks, 42 restricted-license banks and 36 deposit-taking companies which all together have 1,295 local branches. And 186 of these institutions are beneficially owned by interests from 31 countries. It is also home base to numerous FOREX (FOReign EXchange market) brokerage firms. Additionally, there are 85 local representative offices of overseas banks located in Hong Kong. The Smartline Investment Training Institute creates traders who know how to effectively trade with success and peace of mind in any market over any time-frame. Its complete system is concerned not only with the methodology used in trading but also money management techniques and even the psychology of the trader. Smartline is the only company in Europe providing continued education to professional traders who work for banks and multinational financial institutions.